Here is a shot of the new menus I designed for a local Polynesian bar and restaurant (utilizing the wonderful artwork of a local Tiki artist to pepper the menu up with his clever illustrations). Let me know what you think. Here is a glass I designed for a local Polynesian bar and restaurant. Let me know what you think. 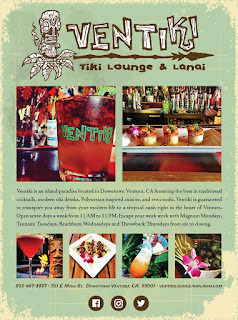 Here is an ad I designed for a local Polynesian bar and restaurant. Let me know what you think.